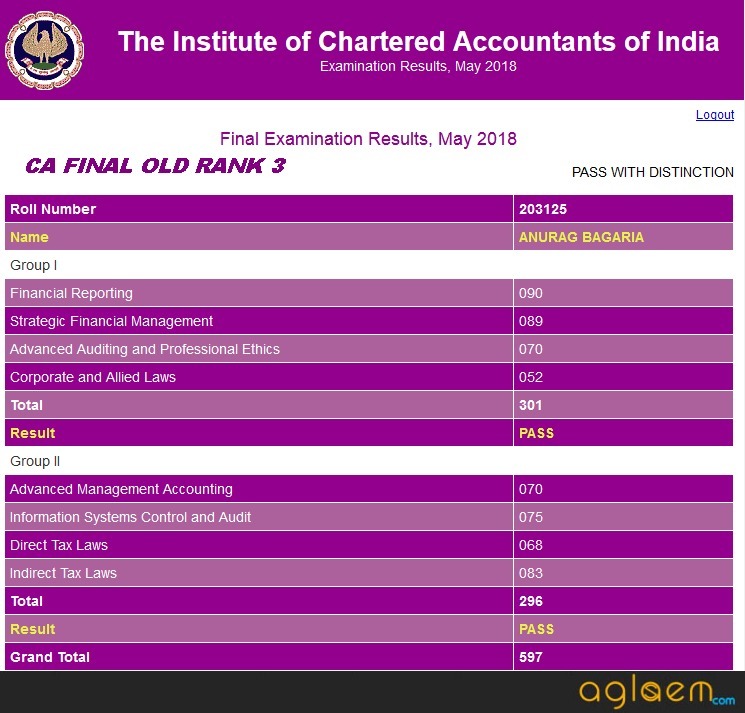 CA Final Result 2018 for old and new unit has been announced. 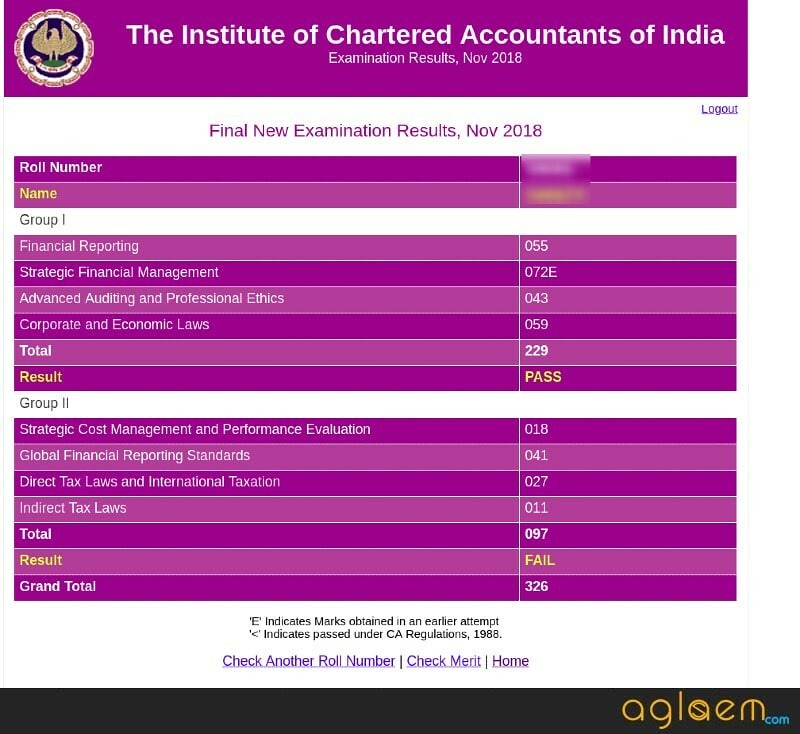 ICAI has announced the CA Final 2018 Result on the official website icaiexam.icai.org / caresults.icai.org / icai.nic.in. 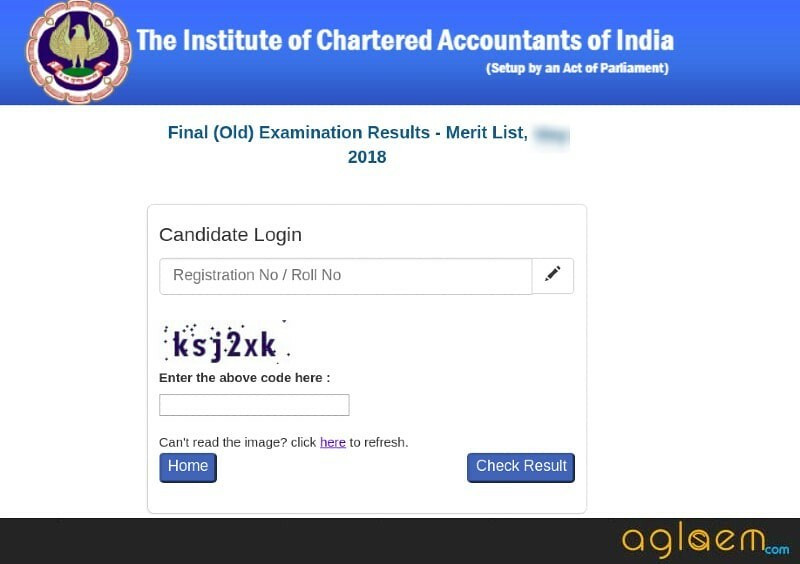 The CA Final Result is announced through login and roll number with pin or registration number is required to access it. The result states candidates marks in each subject and pass status. Along with the CA Final 2018 Result, the merit list for upto top 50 rank holders is also released. 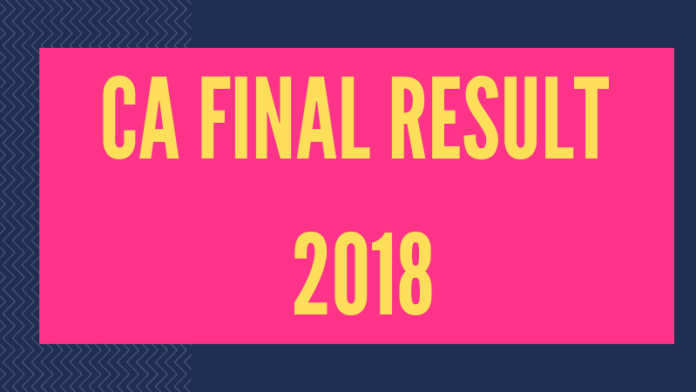 Candidates can check details about CA Final Result 2018 from this page. Latest: Last date for Inspection or Certified copies of answer books and Verification of answer books is now over. The candidates can also apply for the verification of answer books and marks by online mode. The request for submitting the request online must be done within one month from the date of declaration of results. The candidates can check the complete schedule for CA Final Result 2018 from the table below. 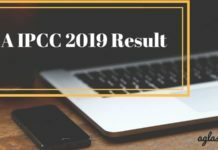 Click here to check CA Final Result 2018 for Old Scheme. Click here to check CA Final Result 2018 for New Scheme. Click here to check CA Final Merit List 2018 for Old Scheme. Click here to check CA Final Merit List 2018 for New Scheme. The list of AIR 1, 2 and 3 in CA Final Nov 2018 examination is now available. Shadab Hussain from Kota has topped CA Final Result 2018 with a total of 74.63 percent marks. Another topper in CA Final Nov 2018 exam is Siddhant Bhandari, who has topped in his group by obtaining 69.38 percent marks. 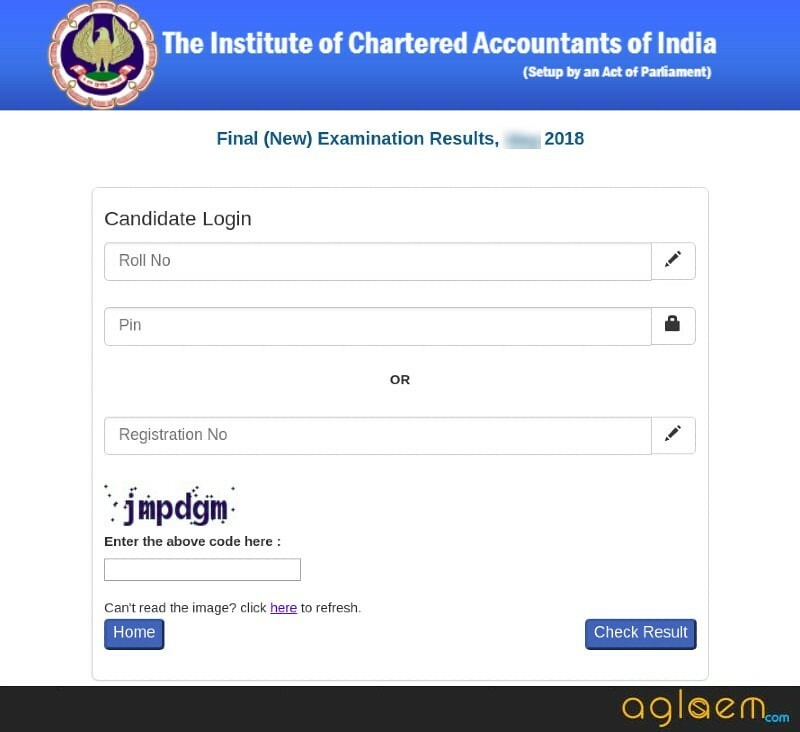 How to Retrieve Registration Number, Roll Number, PIN for CA Final Result Login? In this scenario, we suggest you to call the regional office and be ready with your credentials including a permanent address that you used to register with ICAI. The regional offices of ICAI may help you out in this regard. Admit card of CA Final exam contains your roll number. 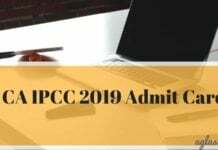 You can download your admit card or see printout / soft copy of admit card so that you can check CA Final Result 2018. If you have a printout of your filled in the form, then you can see the PIN number in that. Or, dial 0120-3054851, 0120-3054852, 0120-3054853, 0120-3054835. the representatives will ask for the registration number and provide the pin. 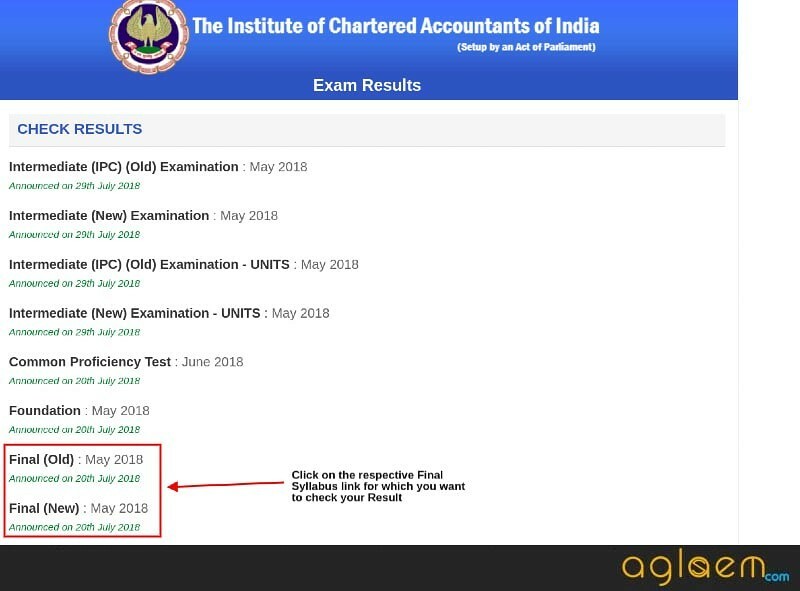 How to Check CA Final Result 2018? Click on the direct which is given on this page for checking the CA Final Result 2918. In the next screen, the candidates need to log in by entering their Roll Number, Registration Number or Pin Number. After entering the login details, click on the “Check Result” button. On submitting the details, the result will appear on the screen. You can also take a print out of the CA Final 2018 Result Card. How to Download CA Final Nov 2018 Merit List? Click on the direct which has provided on this page above. Next, the aspirants have to log in by entering their Registration Number/ Roll Number. Click on the “Check Result” button to submit the details. On submitting the login details, the merit list will be available on the screen. How to Get CA Final Result Nov 2018 by Email or SMS? How to Get CA Final 2018 Result By E-mail? Next, the candidates have to log in by entering their User ID and Password. Then click on the “Login” button to submit the details. A link for ‘Email Registration’ will be available on the screen. In the next screen, the candidates will then have to enter their Name, Roll Number, E-mail id. Now, click on the ‘Register Me’ button to submit and successfully register for receiving CA Foundation result 2018 on their registered email id. How to Get CA Final 2018 Result By SMS? Open the messaging app on your mobile phone. Now, to pass the CA Final 2018 examination the candidates should have obtained the following marks. A candidate is declared as qualified if he/she appear in both the groups simultaneously or in one group in one examination and the remaining group at any subsequent examination if he/she passes in both the groups. A candidate shall ordinarily be declared to have passed in both the groups simultaneously in two scenarios. The first case if the candidate secures at one sitting a minimum of 40% marks in each paper of each of the groups and a minimum of 50% marks in the aggregate of all the papers of each of the groups. The second case is that if a candidate secures at one sitting, a minimum of 40% marks in each paper of both the groups and a minimum of 50% marks in the aggregate of all the papers of both the groups taken together. A candidate is declared to have passed in a group if he/she secures at one sitting a minimum of 40% marks in each paper of the group and a minimum of 50% marks in the aggregate. Those candidates who pass the CA Final Nov 2018 exam at one sitting, with 70 percent of the total marks for all the papers for that examination shall be considered to have passed the examination with distinction. Furthermore, such candidates will be issued the statement of marks in which it is going to be mentioned that the candidate has passed the exam with distinction. Soon after the declaration of CA Final Result 2018, the Institute will send the statement of marks to the candidates. The statement of marks is going to be sent by Post to the candidates individually. However, due to any reason, if a candidate does not get the CA Final 2018 Statement of Marks, then in such a case, the candidates should write to [email protected] The request to get the Statement of Marks for CA Final Nov 2018 should be sent within 4-5 weeks from the date of declaration of results. The CA Final 2018 Rank Certificates are issued to the candidates of up to 50th rank on All-India basis. The top three Rank holders (First rank, second rank, and third rank) will be invited to the Annual Day function of the Institute. The Function is held at New Delhi, generally in the month of February where they receive their rank certificates from the President, ICAI. Rank certificates in respect of the other rank holders will be dispatched to the concerned Regional Offices for further distribution to the candidates. If a candidate is not satisfied with the marks obtained in the exam, he/she can submit a request for verification of marks. The process for verification of marks for CA Final Nov 2018 will open within one month from the date of declaration of results. To apply for the Verification of marks, you will have to first register online and pay the amount as decided by the University. The candidates can apply for verification of marks for CA final exam by online mode only. How to Apply for Verification of Marks for CA Final Nov 2018 Result? To apply for the procedure for verification of marks, the candidates need to follow the instruction as below. Visit the official website for ICAI at icaiexam.icai.org. On the homepage of the website, click on the tab “Login/ Register”. Next, you have to log in by entering User ID and password. Now, you have to apply for Verification of Marks from your Dashboard only. You will have to upload the scanned copy of your handwritten request and submit it online. The candidates need to pay an amount of Rs 100/- per paper subject to a maximum of Rs 400/- for all the papers of a group/both groups/Unit. The candidates can pay the amount by online mode using Credit Card/ Debit Card/ Net Banking. Result for Verification of Marks – As per the information provided on the official website, the result of the verification of marks shall be available on the website in about 6-8 weeks after submitting the request. The candidates can also apply for verification of Answer books for CA Final Nov 2018 exam. The facility for submitting the request for verification of Answer books is available by online mode only. Know here complete details about the process for verification of Answer Books. How to Apply for Verification of Answer Books? On the homepage of the website, log in through your User ID and password. Submit the Login details and then click on the “Apply Now” against the activity ‘Verification’ from your dashboard. In the next screen, the candidates have to select the papers that want to be verified. The candidates should select only those papers in which they have appeared. You will also have to upload the scanned copy of your handwritten application ( duly signed) containing all the relevant details. Next, the candidates to provide their bank account details for processing refund in case of a change in marks. Click on the “Confirm” button to submit the request for verification of marks. Once payment is successful, a payment confirmation page will appear on the screen. It is advised to the candidates to take a print out of the payment confirmation page. For the issuance of duplicate pass/ rank certificate, the candidates need to fill in an online request. To get the duplicate pass/ rank certificate for CA Final 2018, the aspirants have to pay an amount of Rs. 200/- per certificate and Rs. 40/- postage charges. The candidates can pay the given amount by Debit Card/ Credit Card. The candidates will get the duplicate rank/ pass certificate within 21 days of the date of receipt of your request an affidavit. How to Submit Request For Obtaining Duplicate Pass/ Rank Certificate? Visit the official website at icaiexam.icai.org. On the homepage of the website, click on the tab for “Post qualification applications”. Read all the instructions very carefully, and then click on the “Proceed” button. To get the duplicate certificate, you will have to upload the scanned copy of your handwritten request duly signed on the portal. CA Final November 2018 – The pass percentage for May 2018 examination for Old and New course is provided in the table below. CA Final November 2018 – The pass percentages of CA Final November 2018 for group 1 and group 2 will be published here after result declaration. For now we are providing CA Final November 2018 Pass Percentage. 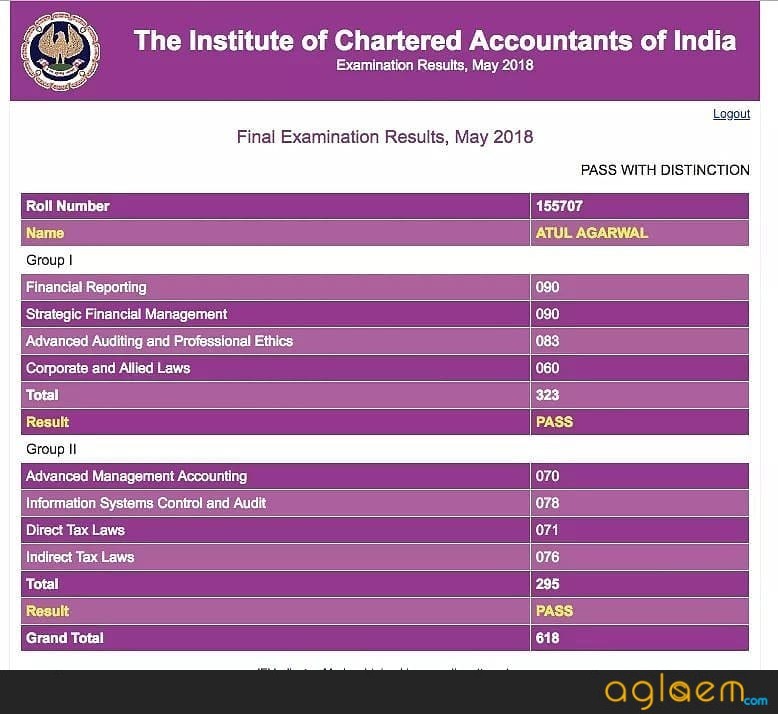 Consequent to the declaration of result as mentioned above, 9479 candidates qualified as Chartered Accountants. 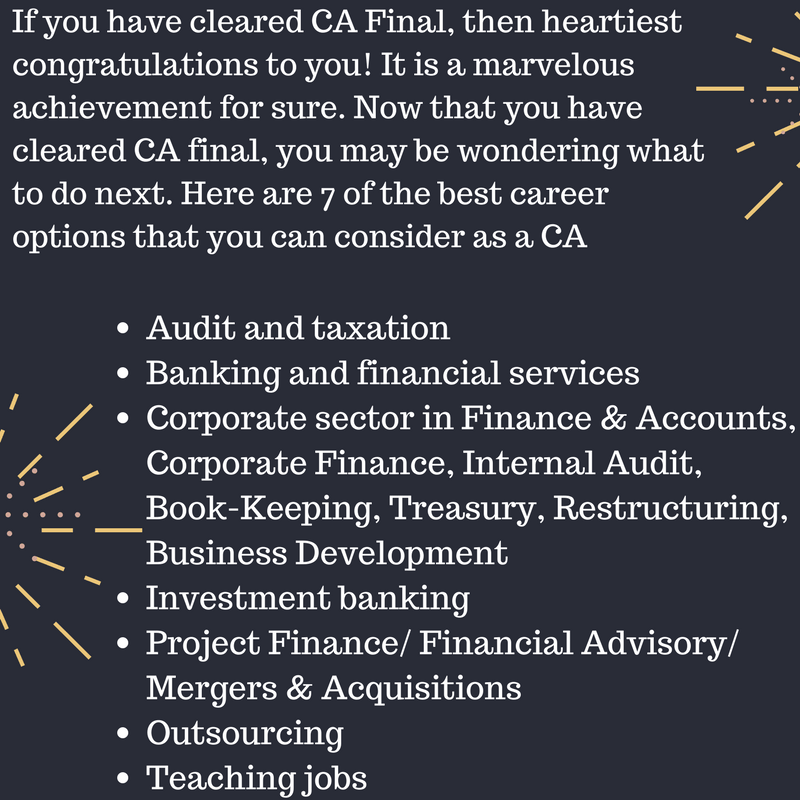 What, in your opinion, is the best career option after clearing CA Finals? Share your thoughts in comments below. 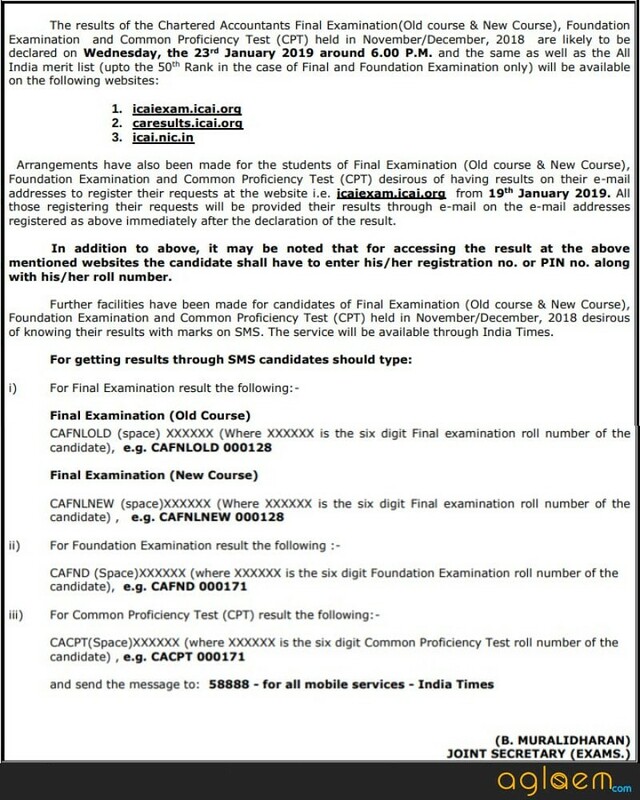 15:56 PM – The mark sheets of Top 3 candidates are available. 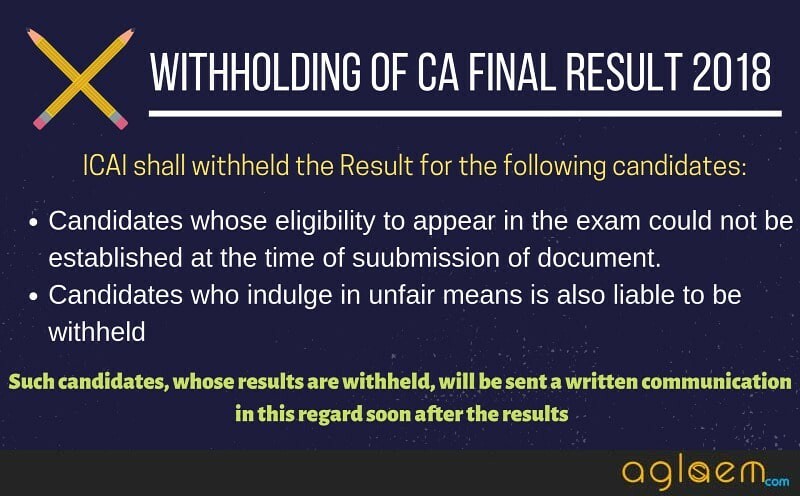 12:57 PM – Result of CA Final May 2018 (existing Scheme) has been announced. 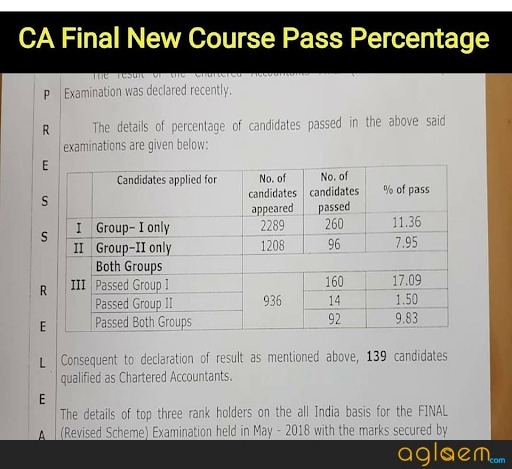 CA Final May Result 2018 pass percentage is Group I: 16.01%, Group II: 13.59%, Both groups: 9.09%. 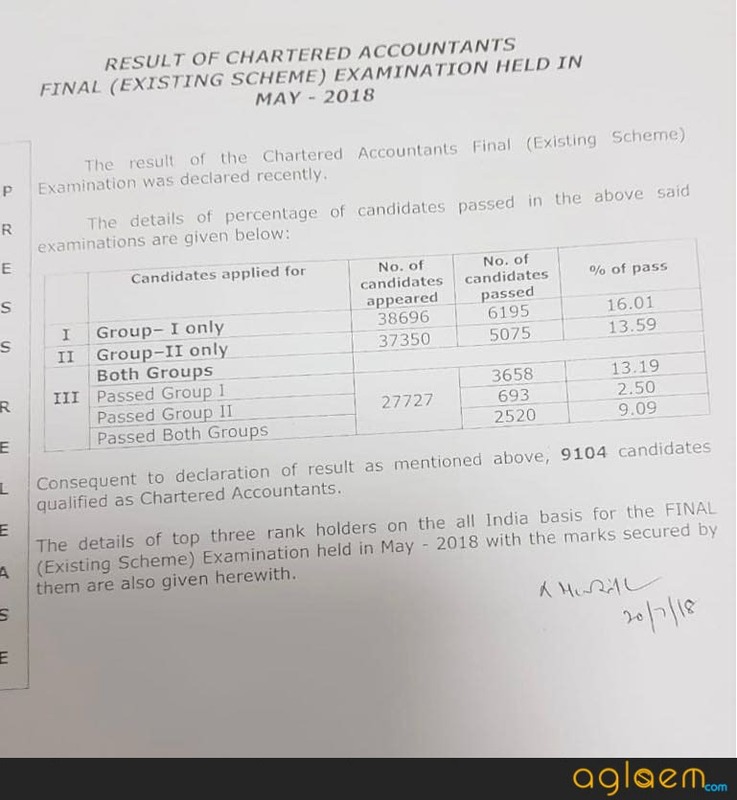 12:45 PM – Toppers were revealed on the Facebook page of ICAI. Atul Agarwal (AIR 1), Aagam Sandipbhai Dalal (AIR 2) and Anurag Bagaria (AIR 3). Congratulations!!!! Know all about the toppers – Click Here. 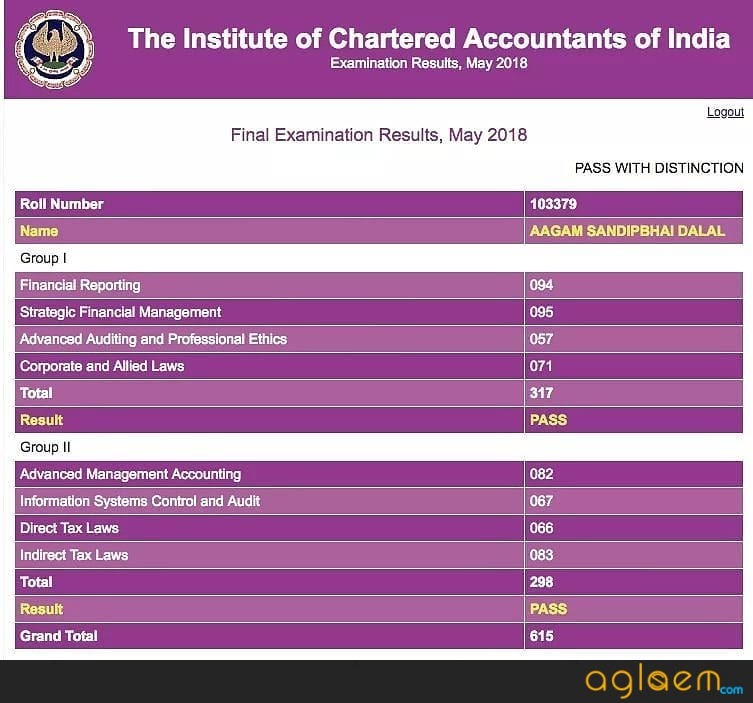 12:36 PM – CA Final (New Course) Result 2018 Pass Percentage is Group I: 11.36%, Group II: 7.95%, Both Groups: 9.83% was revealed on the Facebook page of ICAI. 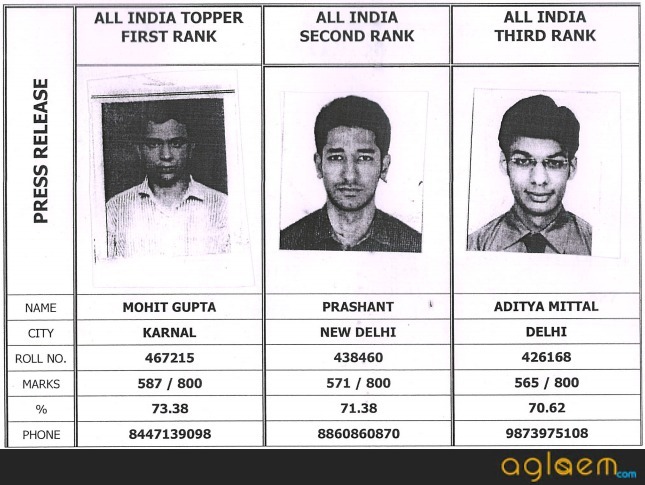 The details of top three rank holders on the all India basis for the Final Exam held in Nov 2017 with the marks secured by them are given below. 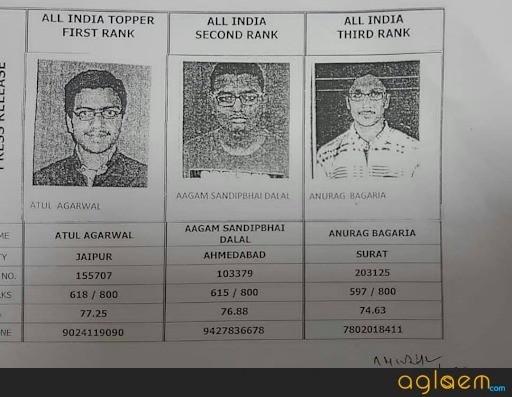 Click Here to check the details of 3 toppers from different cities for Chartered Accountants Final Examination Nov 2017. The data of past 5 years CA Final Pass Percentages are as follows. 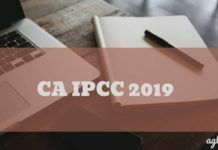 CA IPCC 2019 Result – Check Here for May 2019 exam!